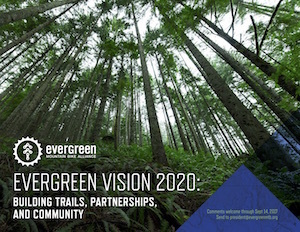 Evergreen has completed its five-year vision for our future and we would appreciate your feedback on the Board of Directors' goals and strategies. Our members sustain Evergreen through membership dues, donations, volunteerism, and more. It is important that we continue to move Evergreen in a direction that our members support - and are willing to invest in - as we implement the plan. Please feel free to send me comments or questions about the plan using the email link, or fill out the short survey form below.